In a nutshell, Collins is asking Democratic leaders for unlimited debate on the defense bill. Reid, in turn, is offering Collins a compromise: votes on 10 separate amendments, seven of which would come from Republicans, three of which would come from Democrats. Collins has responded that this isn’t good enough, and she’ll refuse to let the Senate vote up or down on the legislation. It’s worth emphasizing that Collins just isn’t being reasonable. Looking back over the last couple of decades, a total of 10 amendments is entirely routine for this defense authorization bill, and is actually far more than the number of amendments considered most of the time. Why not just give in and tell Collins she can have unlimited debate? Because Republicans really are desperate to kill the legislation, and the most far-right members will keep offering unrelated amendments indefinitely, running out the clock on the lame-duck session, and derailing the bill. If this is really what’s happening, it’s a pretty sobering reminder of the power of the Republican right wing. Collins is sincerely in favor of repealing DADT, she’s not up for reelection until 2014, and she represents a moderate state. But obviously something has scared the hell out of her. She knows unlimited debate isn’t practical, and she knows that repealing DADT in the next session of Congress is all but impossible. So she’s killing this for years. I wonder who or what got to her? 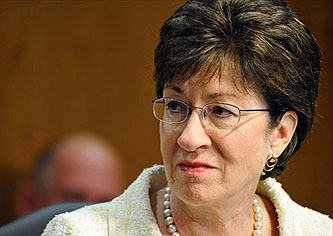 A spokesman for Collins flatly denies she asked Reid for unlimited debate. Rather, the spokesman says, Collins has pointed out to Reid that the average number of days spent debating previous defense authorization bills has been 11 days, with an average of 14 or so amendments considered. Collins has asked Reid to come up with a comparable offer, the spokesman says. Hmmm. Greg also reports that Reid has upped his offer to 15 amendments, so it’s not clear what the problem is.